Heroism in Boudicca's story is the sheer guts it tooks to mount a rebellion against this world power. The most tragic part of it was that it was futile. When it came to an end, she had actually only brought destruction and ruin to her people. 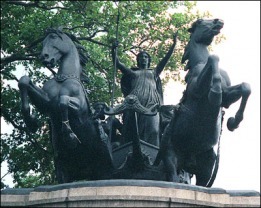 Boudicca is revered as one of the great freedom fighters and one of the valiant resistors the the Roman onslaught. she was someone who tried to preserve the traditions of her people when they were so obviously being overturned. To this day, Boudicca's story continues to inspire. she fought against the evils and injustices that have remained constant throughout history: religious and cultural oppression, slavery, and the brutality of a conquering army. It is a story of courage and determination in the face of persecution and the ongoing life or death struggle for self preservation, dignity, and freedom. Romans continued to rule Britain for another 350 years until 410 AD when the legions were called to Rome to defend the declining empire against barbarian invasion.